Reservations strongly recommended — click HERE to make a reservation. In summer 2015, playwright Dan Fishback traveled to Israel/Palestine to do research for an upcoming theater project. He spent a month meeting with non-violent Palestinian activists, Israeli settlers and others, ending with a surreal visit to Tel Aviv during Pride Week. 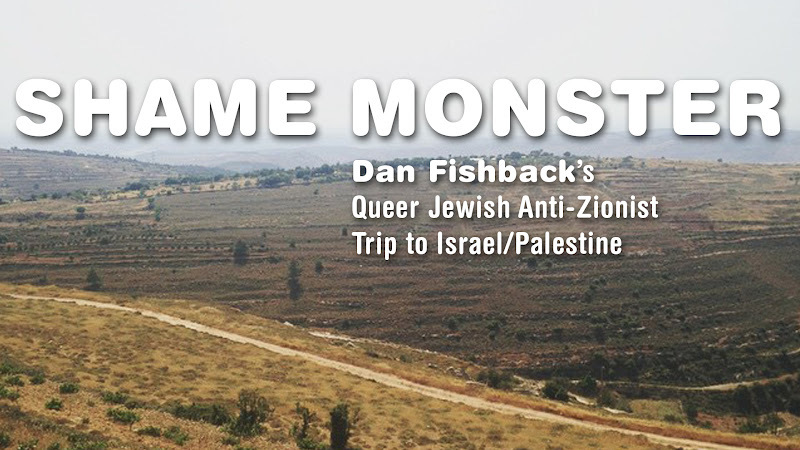 Throughout his travels, Fishback also “interviewed” many Israeli and Palestinian men on Grindr. “Shame Monster” is not a theater piece, but rather a multimedia talk, in which he will share stories from his trip, bear witness to the realities of apartheid, and offer thoughts on BDS, censorship and the various ways U.S. Americans engage with the ongoing occupation of Palestine. Fishback’s travels were made possible by a research grant from the Robert Rauschenberg Foundation. Much of his research was facilitated by Interfaith Peace Builders (www.ifpb.org). This presentation is being sponsored by BAX/Brooklyn Arts Exchange, OUTmedia and Kolot Chayeinu/Voices of Our Lives.